Today our Marianist school, St. Martin de Porres, will celebrate its feast day. This year our school celebrates its 10th anniversary. St. Martin was born at Lima, Peru, in 1579. His father was a Spanish gentleman and his mother a freed-woman from Panama. At fifteen, he became a lay brother at the Dominican Friary at Lima and spent his whole life there-as a barber, farm laborer, almoner, and infirmarian among other things. Martin had a great desire to go off to some foreign mission and thus earn the palm of martyrdom. However, since this was not possible, he made a martyr out of his body, devoting himself to ceaseless and severe penances. In turn, God endowed him with many graces and wondrous gifts. St. Martin's love was all-embracing, shown equally to humans and to animals, and he maintained a cat and dog hospital at his sister's house. 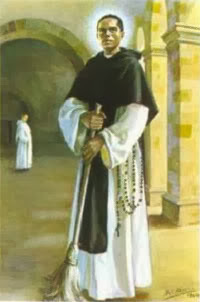 A close friend of St. Rose of Lima, this saintly man died on November 3, 1639 and was canonized on May 6, 1962. His feast day was yesterday, but our school will celebrate today.